Any chance of a Croc fightback was snuffed out early in the final quarter as the Dockers could smell blood. They kept the Crocs scoreless for the quarter whilst slamming home four more goals on their way to a deserved and ultimately comprehensive premiership victory. 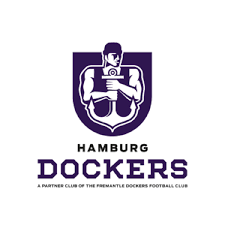 It marks a fitting end to a season that was heavily dominated by the Hamburg Dockers. Now they can party hard before preparing for 2019, as all other clubs are already doing. The day in Dresden saw some entertaining curtain-raiser matches prior to the main event. In the AFLG Cup, the Frankfurt Redbacks claimed some silverware for the season, downing the Wurttemberg Giants 71 to 41. Players from the host team, the Dresden Wolves, helped make up the numbers for both teams on the day. The first match of the day saw the AFLG Women’s team go down narrowly to the visiting Denmark Valkeries team. After a tight contest, the Valkeries just pipped the AFLG team by three points, winning 71 to 68. Attention will now turn to the off-season tournaments with next month’s Euro Cup in Cork, and later the Champions League in Amsterdam where the Dockers will represent Germany. Just might be able to use the match in a 9's European Ranking scheme I'm slowly compiling. Any expat Aussie's may rule the match ineligible.